Een daglichtsensor kan worden gebruikt voor dingen die in de dag worden geactiveerd en in de nacht niet, dus een Daglichtsensor is alleen overdag, door daglicht, geactiveerd. The simplest NOT gate that can be created. The redstone lamp will turn on during the night, and turn off at sunrise. The block in the middle can be anything on which a Redstone Torch can hang (Except for a Redstone Block). By connecting the sensor to a NOT Gate (inverter), it will output a signal when the light level is LESS than 4, so you can, for example, make lights that turn on at night, or gates that automatically close. You can also detect moonlight by blocking off the detector so it cannot see light, then pointing a comparator away from it. Because you can measure exactly what light level it is, you can make a clock. For example, for every light level it is, 1 light goes on a board. When it is night, the word "Night" is illuminated on the board displaying light level or time. This can be useful for servers, especially if you do not have the ability to create one using piston memory, or do not wish for one as it can be complicated or laggy. The daylight sensor can be placed atop TNT unlike most redstone devices. If planted at about midnight, this can make for an excellent timebomb, as the TNT will be ignited when the sun rises. Since the skylight is measured, which is shadowed out by blocks above, the sensor on TNT can be used in traps for players breaking the (e.g. ore or cake) blocks above the sensor. The Daylight sensor bomb can be rigged to go off at different times. If you want it to go off during the day, wire redstone to the TNT from the daylight sensor. While you can just place the sensor on top of the TNT, the TNT will glitch, and you will see the TNT go above the daylight sensor. If you want a bomb to go off during the Night, You will need a NOT Gate, but other than that, its the same. For a bomb to go off at noon, you will need a Redstone Comparator. The Daylight sensor will go through the TNT, but since the lever is always full power, and the daylight sensor gets best power at noon, the bomb will go off at noon. Using some note blocks and redstone circuitry, you could make a set jingle that plays at certain times of the day, such as a device that warns you that nighttime is over, or is beginning. This could be used as a sort of morning alarm if you do not use a bed. The daylight sensor can easily be used to signal things at different times of day. With command blocks in the game, it can do many more things, like broadcast messages or change everyone's gamemodes (For whatever reason). Below are different methods for it. If you are mining and you want to come up at a time of day, you can connect the day light sensor and make it either send a redstone pulse down your mine or broadcast a command block message. First broadcasts a message to the server, second one tells a message to a player. Using an old fashioned redstone clock that is synchronised with the Minecraft day that is broken up into segments according to the daylight sensor power output schedule, it is possible to use many daylight sensors to build a rainstorm and thunderstorm detector. Use a comparator to reduce the redstone clock's signal strength to below that of the daylight sensor's clear day output. Wire this into the side of another comparator that has a daylight detector wired to the back. The wire coming out of the end of the comparator will deactivate whenever there is a storm. Using this you can detect both rain and thunderstorms using two lines with adequate comparator sensitivity. Using this you can signal an alarm whenever there is a storm, count the number of storms, count the duration of the storms using another clock and some type of memory, and even all three. These tables link output values to the time they occur as well as co-occurring light levels. Note that while the sensor responds to changes in light level, the light level only modulates a separate scale that more or less follows sunlight. This modulation does make the tables invalid if the sensor doesn't have a direct view of the sky. Due to a bug, an encased sensor currently emits a signal at night. The following table corresponds to a sensor that cannot receive any daylight. Weather is irrelevant at night. Problemen met betrekking tot 'Daglichtsensor' worden bijgehouden op de bugtracker. Meld problemen daar. Daylight Sensors only work by sunlight and cannot be activated by other light sources such as luminescent blocks or torches. Daylight Sensors are less than a slab tall, which is like redstone repeaters, redstone comparators and trapdoors. A daylight sensor connected to a powered dispenser via redstone wire will cause the dispenser to fire every time the light level changes. Rain will affect the sensor. Daylight Sensors, as well as most redstone technology, appear more similar to modern technology compared to most other blocks. Daylight Sensors can be used as fuel in furnaces. Due to the fact that a covered sensor gives output at night, it is possible to create a 24H Redstone clock that is synchronous with the Day-night cycle, that still works during the night. A night sensor (Covered Daylight Sensor) will start giving redstone signal after 14341 ticks and stop after 21658 ticks instead of giving signals exactly at nighttime. A daylight sensor would be used as a power source (solar panels) in the real world, but since it's extremely easy to generate redstone power in Minecraft it's useful only as a sensor. Iron doors opening during daytime and shut during the night because of the daylight sensors. A comparison of sensor outputs, depending on conditions. An example of using the daylight sensor to provide lighting at night. A picture of how the sensor can be used as decoration. Using a sensor and an analog-to-digital converter to make a meter. The sensor and analog-to-digital converter making the meter. 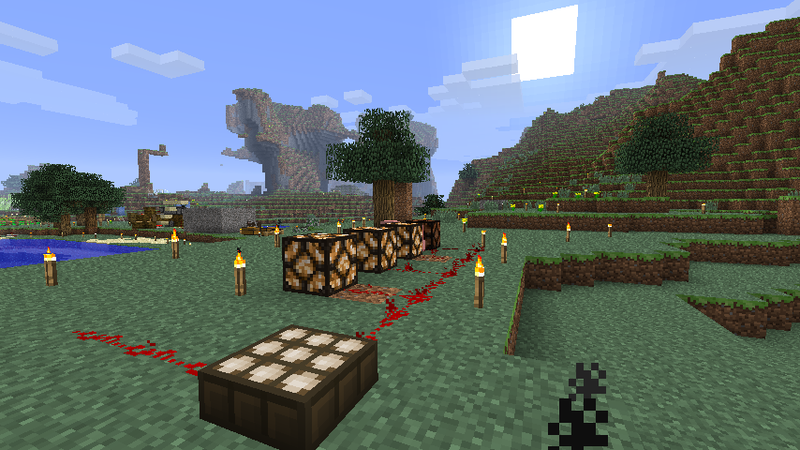 This shows that old wooden slabs are incompatible with the daylight sensors' crafting recipe, and how newer differentiated wooden slabs must be used.